President Trump barbecues sacred cows of the Left daily. Leftists have ushered in traditions that had nothing to do with America. All for the sake of appeasing their idiot base. Eid al-Fitr, which marks the end of the holy month represents such a tradition. While the first White House iftar dinner is said to have been hosted by President Thomas Jefferson in 1805, it was Hillary Clinton who resurrected the event in February 1996. As First Lady, Clinton hosted about 150 people to celebrate the event. Subsequent to the Clinton event, the sunset dinner, attended by legislators, diplomats and leaders within the US Muslim community, became an annual tradition starting in 1999. Further, it has been observed by the past three administrations. George W Bush held an iftar dinner every year of his two terms. Believe it or not, Bush actually continued this dinner after the terrorist attacks of 11 September 2001. “From President Bush’s perspective, it was important post-9/11 for the administration and to show the White House and the US is inclusive of all people and religions, especially after such a traumatic event. We were not at war with Islam itself but with terrorist organizations. If there were a time to end this nonsense, Bush missed the opportunity. President Trump didn’t miss his. America was not founded as a Judeo-Christian-Islamic country. Undoubtedly, Islam is not compatible with Western culture. Obama tried to force us to accept Islam. 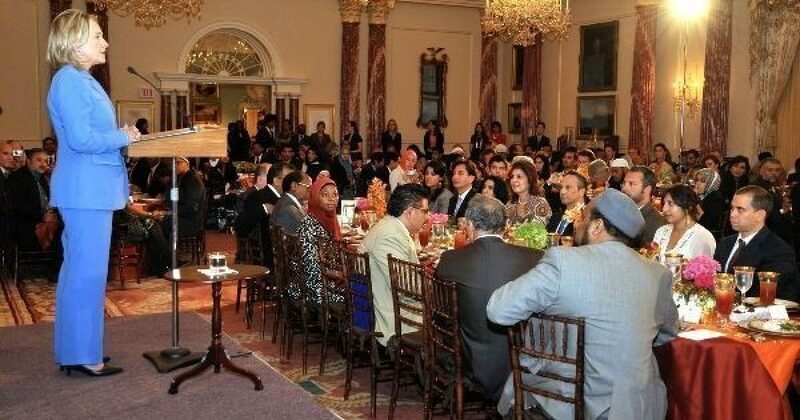 Recall in 2010, Obama hosted an Iftar meal to ceelebrate the right for Muslims to build a mosque next to Ground Zero. President Obama hosted an Iftar meal breaking the day’s Ramadan fast on Aug. 13. In his speech, he supported the right of the Muslim community to build the planned controversial mosque two blocks from Ground Zero, comments that touched off a firestorm including Senate Majority Leader Harry Reid (D-Nev.) breaking with the president and saying the Islamic center should be built elsewhere. Even Harry Reid recognized the affront to America this mosque represented. Obama comforted Muslims in their pursuit to build a monument what they deemed a conquest. Thankfully, President Trump sees things very differently. The president wishes Muslims well. Liberals appear to be looking past President Trump’s words of peace and focusing on the fact that he refused to spend taxpayer money on hosting a dinner for the end of a holy month during which 1595 people were killed in 174 attacks committed in the name of Islam. The State Department also declined to host a Ramadan dinner. Earlier this year Secretary of State Rex Tillerson reportedly said the government would not host the dinner. He also issued a statement on Saturday, which read, “This holiday marks the culmination of Ramadan, a month in which many experience meaning and inspiration in acts of fasting, prayer, and charity. The brief statements provide a stark contrast to the holiday message issued by former President Barack Obama, who warned against the “rise in attacks against Muslim Americans”. Leftists clearly like to pick and choose when the government exercises separation of church and state. No such separation truly exists. So, if there is any leeway given on this topic, it will be for Judeo-Christian events, not Islam.